The last date for payment of taxes and filing of GST Return in Form 3B for the month of July is 20. of August 2017. Since it is the first Return to be filed under GST, the tax payers and the tax practitioners have requested for few more days to file their Return. Also there have been requests from States which are hit with floods to extend the last date for filing of GST Returns. 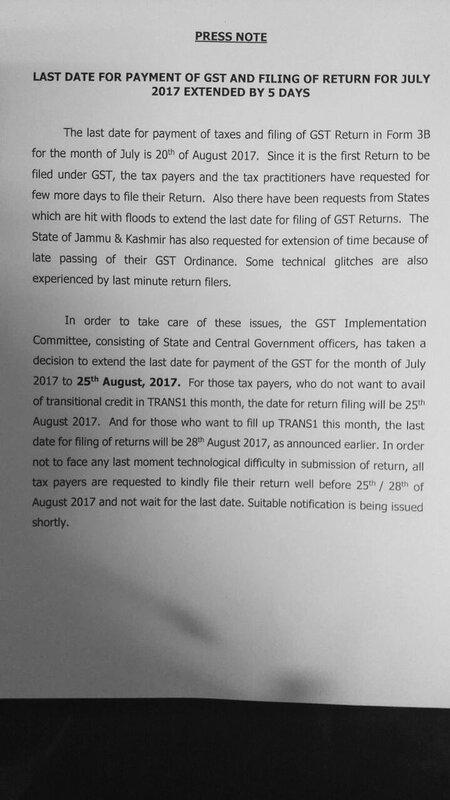 The State of Jammu & Kashmir has also requested for extension of time because of late passing of their GST Ordinance. Some technical glitches are also experienced by last minute return filers. In order to take care of these issues, the GST Implementation Committee, consisting of State and Central Government officers, has taken a decision to extend the last date for payment of the GST for the month of July 2017 to 25th August, 2017. For those tax payers, who do not want to avail of transitional credit in TRANS1 this month, the date for return filing will be 25th August 2017. And for those who want to fill up TRANS1 this month, the last date for filing of returns will be 28. August 2017, as announced earlier.